97th day of the year. There were then 268 days left in 2019.
on the 15th week of 2019 (using ISO standard week number calculation). 19th day of Spring. There were 76 days left till Summer. April 7, 2019 was the 33rd day of Lent (Christian Observance). 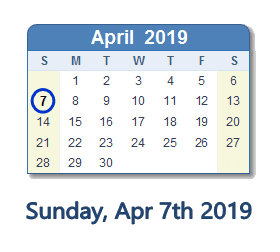 What happened on April 7th 2019? Elle vole une voiture... avec un bracelet de localisation à la cheville!